Cummins' CEO Thinks the Stock Is "Significantly Undervalued." Is It Time to Buy? Cummins wants to pay shareholders even more as the trucking industry takes off. What else do you need to know? Cummins Inc. (NYSE:CMI) is recalling 500,000 trucks to fix defects in emissions-control systems. This news seemed to have overshadowed a strong set of second-quarter numbers that the company released around the same time, roughly three weeks ago, capping potential upside in the stock. Cummins shares still are down about 19% year to date, as of this writing. 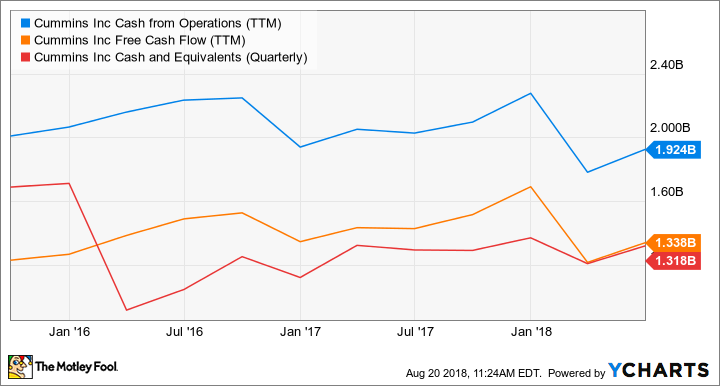 It has come to a point where, during Cummins Q2 earnings conference call, CEO Tom Linebarger explicitly said he believes the stock is "significantly undervalued" -- so much so that the company now wants to return a whopping 75% of its operating cash flow, up from 50%, to shareholders this year and is accelerating share repurchases. Does that mean you should buy Cummins shares while they're still cheap? Here are some solid reasons why you might want to. To be fair, investors' apprehensions aren't entirely misplaced. Cummins has had its fair share of emission troubles lately, with another recall involving roughly 232,000 engines in Fiat Chrysler Dodge Ram trucks already underway. However, recalls aren't anything new in the transportation industry. Cummins' largest customer PACCAR (NASDAQ:PCAR), for instance, is recalling more than 3,000 Peterbilt and Kenworth trucks to fix a brakes defect, after another 2,000 or so trucks earlier this year for a transmissions-display issue. Now is the time to act on Cummins stock. Image source: Getty Images. Of course, Cummins' recalls are huge, but note that the company decided to "voluntarily" recall all engines of a certain make after a sample tested negative. A voluntary recall of this size reflects Cummins' commitment to quality standards -- something the company has come to be known for over the decades of its existence. Moreover, the defect in the engines built between 2010 and 2015 are mechanical in nature and didn't pose a safety hazard (which would be a cause for concern). Cummins also already booked charges to the tune of $404 million toward replacement costs in its last two quarters. That's not a small price to pay, but it won't send the company's profits tumbling, either. In fact, Cummins' sales and market-share numbers prove that customers continue to trust the company with their engine and component requirements. Image source: Cummins Inc. Chart by author. As is evident, Cummins' sales from each of its four business segments are growing steadily. In fact, the company's revenue hit record highs in the second quarter, with sales surging 21% year over year, to $6.1 billion, putting Cummins on track to a record year. Heavy-duty trucks: Higher end of its guided market share range of 31%-34%. Medium-duty trucks: 75%-78% versus previously guided 72%-75%. Cummins will have cornered nearly one-third of the heavy-duty and three-quarters of the medium-duty North American trucking markets in 2018. Meanwhile, the trucking markets are firing on all cylinders, with orders for heavy-duty Class 8 trucks on pace to hit a record this year. PACCAR estimates North American Class 8 industry retail sales to range between 265,000 and 285,000 trucks compared to 244,000 trucks in 2017. Cummins has a more detailed break-up forecast to give. Not surprisingly, Cummins now sees its full-year sales growing 15%-17% compared with 10%-14%. That's not an upgrade you can ignore. Cummins' plan to return 75% of operating cash flow to shareholders has given critics a reason to slam the company for a possible lack of growth opportunities. Cummins may not see a big-ticket acquisition or partnership opportunity on the horizon, but that doesn't mean it isn't growing. The company outlined several growth goals during its Analyst Day presentation late last year, including becoming a leading powertrain supplier. Accordingly, Cummins will acquire California-based Efficient Drivetrains -- a manufacturer of electric and hybrid power solutions for commercial vehicles -- in coming weeks. This comes close on the heels of Cummins' joint venture with Eaton, which contributed 10% to Cummins' components segment sales growth in Q2. CMI Cash from Operations (TTM) data by YCharts. Most importantly, Cummins' war chest is sufficient to fund intermediate growth moves, as well as dividends and buybacks, as the chart above shows. Cummins recently raised its dividend by 5.6% and just announced accelerated plans to buy shares worth $500 million from Goldman Sachs & Co. LLC as part of its aggressive buyback program. The company has a price-to-cash-flow of 12 times and a dividend yield of 3.2%, and the trucking markets are roaring. Long-term investors can back Linebarger's "our stock is a good investment now" sentiment.